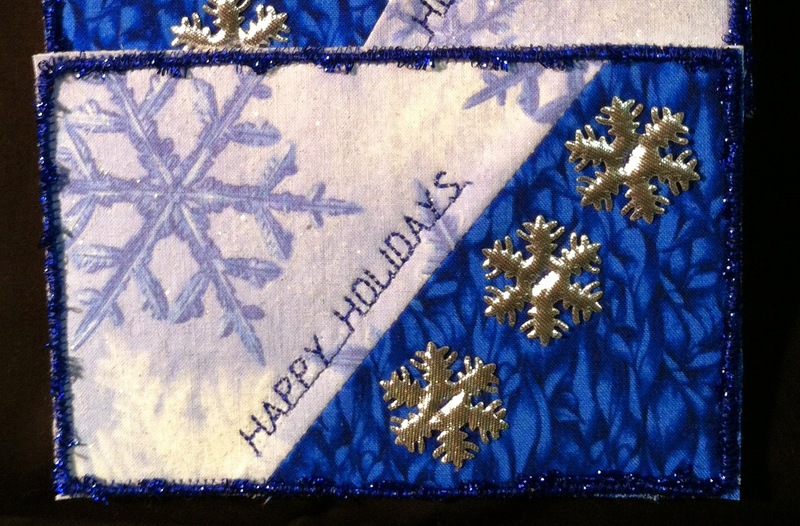 Brandi-Lynne Maslowski of Canadian Quilt Talk radio is hosting a postcard exchange. Theme of the exchange is SNOWFLAKES. Sign up is now closed unfortunately, but today we are sending in photos of our completed postcards. Here are mine. I chose what I think is an "icy" colour scheme; rather appropriate given the theme, don't you think? Even the background fabric fits the theme! LOL! I'll get the addresses of the folks that are going to receive these lovely beauties in a couple of days. I had so much fun making these, I think I'll put a few more together. very pretty - icy cold, sparkly bright - just like our current weather! Lovely! I'm sorry they are so fitting to your current weather, too bad the weather can't limit the cold and snow to Christmas Eve! These are super! And definitely icy looking. You will get quite a few lovely postcards back! I think I was walking through those icy gems this morning. I like the gold snow flakes, adds just a hint of warmth.